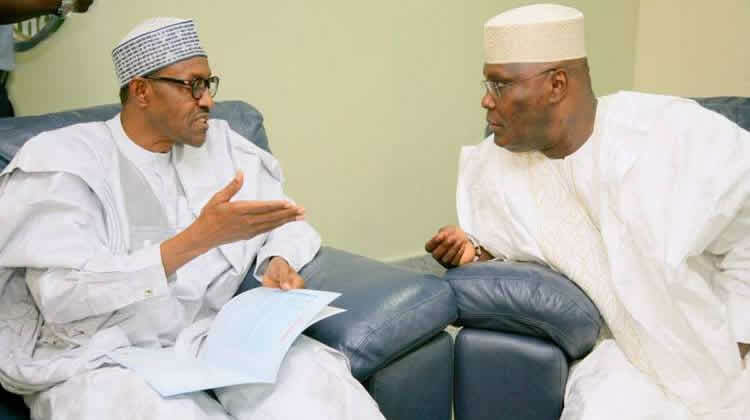 President Muhammadu Buhari and Atiku Abubakar have shutdown each other's homes with their respective campaigns. According to a report by Vanguard, the candidate of the All Progressives Congress, APC, Muhammadu Buhari and that of the Peoples Democratic Party, PDP, Atiku Abubakar have taken their campaign trains to each other’s hometowns in Adamawa and Katsina states, respectively. While Atiku Abubakar took his campaign to Daura, the hometown of President Muhammadu Buhari in Katsina state where he was received by the Emir of Daura, Alhaji Faruk Umar Faruk, President Buhari also took his campaign to the hometown of Atiku Abubakar in Adamawa State where he promised to complete projects he had initiated in the state as head of the defunct Petroleum Trust Fund (PTF). Atiku is from Jada, in Adamawa state. In Daura, Atiku said he found it necessary to visit the state, which he said is the ancient emirate in Katsina, to commiserate with the Emir upon the various times that bandits attacked the emirate, and as well to seek for support and endorsement. Atiku also went on to state his plans for Katsina, citing his relationship with the Yaradua family. He said he plans to use education to ameliorate the Almajiri crisis besieging the State and the emirate, which has since become a menace. The Emir thanked him for being thoughtful enough to visit. He gave the PDP candidate his blessings. Atiku went forward to shut down the Muhammad Diko stadium with jubilant supporters who could not wait for 16th of February, to give him their votes. Recall that the PDP has ruled Katsina for 16 years, since 1999. Meanwhile, President Buhari, while in Adamawa, told his supporters that “The projects we started in PTF together with an indigene of this state, Engineer Ahmad Salihijo have not yet been completed.